Implants are amazing feats of engineering that replace teeth where there are no roots. 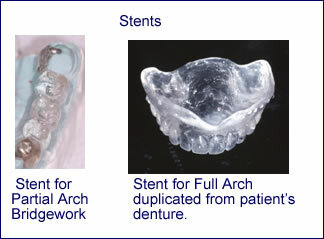 Implants can help patients get rid of dentures or avoid preparing healthy teeth for bridgework. The implant is a substitute for a tooth root called a “fixture”. Special components are precision-machined to fit into this fixture to support bridgework. 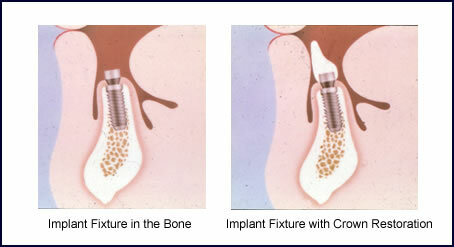 During implant surgery, fixture(s) are inserted into the bone where there are no roots. They are completely submerged so they are not subjected to biting forces in order to fuse with the bone for 3 to 4 months. After this period of time the fixtures are uncovered in order to support crown and bridgework. The process of “fusing” an implant fixture to the bone is called Osseointegration. Osseointegration—first discovered by Per-Ingvar Brånemark in the 1950’s—has created a revolution in dental and orthopedic prosthetics. The profession is truly indebted to Professor Branemark for his diligent investigation of osseointegration in the tradition of classical science. His methodical approach has allowed an estimated 800,000 people throughout the world to benefit from his discovery. After observing in the late 1950’s that bone could grow in intimate contact with the surface of titanium, Branemark conducted careful experiments in the 1960’s that led to 10 years of clinical trials. By the time osseointegrated implants came to this country in the early 1980’s, their use for prosthetic reconstruction was backed by solid clinical evidence. Between 1965 and 1971 Branemark’s research team placed more than 1618 fixtures in 235 jaws. The original cases have been followed for more than 30 years, and those patients presented with different backgrounds and physical challenges–including Sjogren’s syndrome, arthritis, long periods of edentulousness, accidents to the jaw and cleft palate1. Our office was among the first in Westchester County to restore osseointegrated implants when they first came to this country in the early 1980’s. We have enjoyed the same high percentage of success as Dr. Branemark’s research predicts. 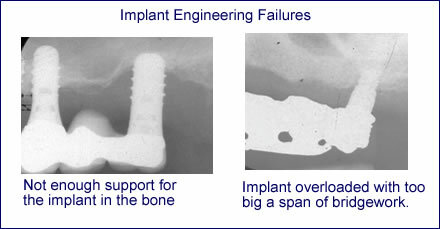 It is important to realize that implants are very much feats of engineering. As with any structure of engineering (i.e. buildings and suspension bridges), they cannot be overloaded or they are likely to fail. As a result, implant placement must be carefully planned. Typically they are placed in the bone, buried under the gum, and allowed to fuse with the bone for 3 to 6 months before they are loaded with forces. After this period of osseointegration, the implants are uncovered and the final restorations are made.